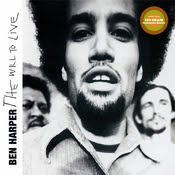 This saturday is the day hubby and I go out on a date to see Ben Harper play an acoustic show. This is exciting us quite alot. Percy will be with his lovely uncle and aunty while we (or just me) cry listening to Ben Harpers lovely songs. Todays song is from his 3rd album, The Will To live. It's called Ashes, and its really lovely. Do take a few minutes to listen to it! More of my favourite songs of his coming up this week!